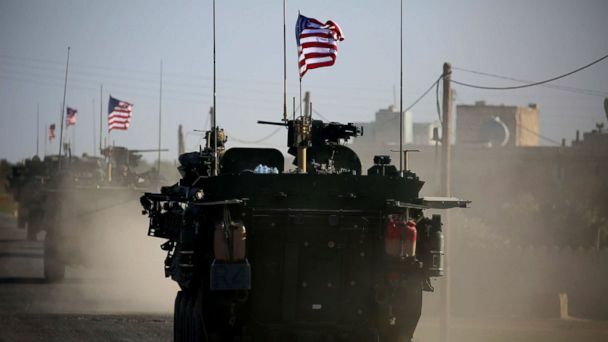 The U.S. military began moving military equipment out of Syria this week, but no U.S. troops have left, two U.S. officials said Friday. Other officials said there is still no timeline for the pullout of the 2,000 U.S. troops from Syria following President Donald Trump's surprise decision to withdraw them last month. Earlier on Friday, a U.S. military spokesman in Baghdad had issued a statement that the U.S. military had "begun the process" of a deliberate withdrawal from Syria. Two U.S. officials told ABC News that only equipment has been moved out of Syria and that no American troops have left Syria. One of them told ABC News that in recent days military equipment has been moved out of Syria into Iraq. The official added, "We have made a number of preparations for the deliberate withdrawal from Syria including planning for personnel and equipment moves, preparing facilities for retrograde and moving materials out of Syria." The official said the limited movement of cargo out of Syria was being carried out as the opportunity presented itself "or as part of pre-planned movements." "CJTF-OIR has begun the process of our deliberate withdrawal from Syria," said Col. Sean Ryan, a spokesman for the anti-ISIS coalition had said in an earlier statement released Friday. "Out of concern for operational security, we will not discuss specific timelines, locations or troops movements." The withdrawal of equipment came amid conflicting statements over when a withdrawal of American troops would begin and at what pace since President Donald Trump abruptly announced the U.S. would leave last month. In late December, former Defense Secretary James Mattis signed orders for the military to follow Trump's pullout announcement. It was that decision, as well as the president's decision to reduce the number of troops in Afghanistan, that led Mattis to resign. But U.S. officials say there are no timelines attached to that order as the U.S. military continues developing the timing of that withdrawal plan. According to one of those officials, the orders signed by Mattis can be adjusted to include timelines as decided by the White House. So far, there has been no such policy decision. Military planners have developed plans that could take as long as four months for the U.S. to pull out all of the troops and equipment inside Syria. That timeline took into account that the U.S. had accumulated a lot of heavy equipment inside Syria that would have to be removed. But U.S. officials stressed that no decisions had been made about the pace of withdrawal. Officials have said that a withdrawal of equipment could lead to the temporary deployment of additional forces specifically tasked with equipment removal from Syria as well as the security of those troops. The Syrian Observatory for Human Rights reported on Friday that 10 armored vehicles, in addition to engineering machines, withdrew Thursday evening from the U.S. base in al-Remelan in the al-Hasaka province in northeastern Syria. A U.S. official said the withdrawal of equipment without its being replaced would constitute part of the withdrawal. Earlier this week, National Security Advisor John Bolton indicated that the pullout of U.S. troops could take much longer. During a visit to Israel, he said a Syria pullout would be pegged to the total defeat of ISIS and assurances from Turkey that it would not attack America's Kurdish allies in Syria after a troop withdrawal. Turkish President Recip Erdogan later labeled that characterization as a "serious mistake." He also laid out a tougher line, saying there would be "no concessions" and that the new plan contradicted the "clear agreement" he had with Trump for a U.S. pullout from Syria. On Thursday, Secretary of State Mike Pompeo pushed back strongly that Bolton and Erdogan's comments contradicted each other. "There's no contradiction whatsoever," said Pompeo. This is a story made up by the media." Pompeo added that while Trump had decided to withdraw troops from Syria, the U.S. commitment to defeat ISIS would continue. "We're going to do it in a way, in one particular place, Syria, and differently," said Pompeo.